They are perfect for children aged five and up, and include 250 stickers along with puzzles to complete, colouring sections and lots of interesting facts to learn. The main character Amelia loves technology and her friend Marco loves maps. 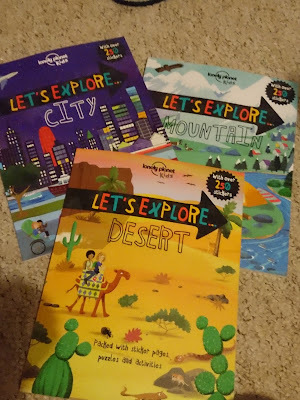 They work together to explore the world and these three new books cover the desert, mountains and cities. In Let's Explore...Desert they go on a trip around the world's dryest deserts. ride camels and discover dinosaur fossils. In Let's Explore...Mountain they climb up some of the world's tallest mountains and ski in the Alps. In Let's Explore...City they visit New York, Sydney and the Eiffel Tower. Chunk loved learning about all of these subjects and using stickers to show off some of his the things he learnt along the way. I recommend these to children of primary school age and these are great on long journeys in the car or on a rainy day! To win a set of these three books simply fill in the form below, good luck! I have always wanted to explore Africa to see the animals in the wild, especially elephants, lions and giraffes. I watch any nature programmes about Africa on tv and on my bucket list is an African safari! Australia to see the bush and the wildlife. I would love to go to Morocco,for the cultural experience. I would like to explore Canada to see bears and the mountains. Egypt, so many mysteries & marvel's! I would love to explore the world because there is too many beautiful places just to pick out one. I would love to explore Scotland.I'm a big fan of the tv series Outlander and am keen to explore the wonderful scenery and delve into its history. Would love to explore New York City, have always wanted to go! Australia to see the outback and the beaches. I'd love to explore New Zealand - I'm fascinated by the great outdoors & it looks amazing there! I would love to explore more of America, I've been to new York and Florida and loved it, would love to see more. I'd love to exlplore deep to the ocean floor....I wonder what's down there we haven't yet discovered? I would like to explore Africa to see wild animals in their own natural habitat. The pyramids, I love anything to do with the ancient Egyptians. I will love to explore The Vatican . Discover it all and the beautiful architecture. I'd love to explore GCHQ just to see all the secret stuff they have there. I would love to explore the grand canton. I've never been to the states and it is my dream destination. I would love to explore costa rica! So much to do and see there and we love nature! I'd love to explore far enough north to see the Northern Lights. I'd love to explore Dartmoor in Devon more, I find it fascinating and unknown even though I grew up there! I would love to explore Dubai, it looks so stunning. Gosh, I think I would like to explore somewhere unusual such as Pitcairn Island. I'd love to explore New York as I've never been!